Adam and His Kin, by Ruth Beechick. Originally published in 1990. 176 pages. When our sixth-grade student was assigned this book for her literature class, I’d never heard of it. It is basically the characters and stories of Genesis framed as historical fiction. I wasn’t sure how I would feel about it when I picked it up. Apparently, it is well known in homeschool circles, and opinions on it are mixed. A positive take can be found here, a negative one here, for those interested in both sides of the issue. As I began to read it, my initial reaction was a mixture of apprehension and horror. It seemed sacreligious to me to fictionalize Scripture. What, I thought, would possess anyone to do such a thing? However, I kept reading and allowed our daughter to keep reading primarily because I fancy myself open to new ideas and I genuinely trust the heart, intentions, and faith of the administrators and staff of the program where we have our kids enrolled and taking classes. After I got over my initial reluctance to the very idea of Ruth Beechick’s project, I began to see it differently. It gave us opportunities to go back and study Genesis closer, note contradictions and parallels, and remember that what we were reading the author’s attempt to help the reader see these people as more than just Bible story characters. On the whole it was a decent read, when kept in proper perspective. The literature teacher who assigned it was careful to make the distinction between the Bible and this book, and even gave the children opportunities for class discussion on the pros and cons of reading such a book. If there was one thing I appreciated about the book more than any other, it was that the author tried to capture the universality of human nature, that it is as it has always been over time. The sin nature that motivated Adam, Eve, Cain, Ham, or the builders of Tower of Babel was as evident then as it is today. Greed, jealousy, lusts for power and self-aggrandizement are as old as humanity itself, despite our tendency to believe that people are uniquely horrible in our time compared to times past. That said, it certainly needs to be read with caution, and an eye toward the Scriptures. Content advisory: I wouldn’t recommend this book to any child under middle school age and certainly not to anyone without an in depth knowledge of the Book of Genesis. Our entire family went to see this movie yesterday. I didn’t love it or hate it, but it was thought provoking. So although it doesn’t meet my previously stated criteria for being reviewed, it did add another item to the list of things that I thought made it a worthy film. I haven’t had a chance to date to read the book, but I plan to in the near future and hope to review it here upon conclusion. One the things I usually do however, when viewing a film based on true events, is fact checking at a glance. This is easily enough accomplished via a website such as History vs. Hollywood, which fact checked Hidden Figures here. The brilliant and groundbreaking nature of the work these three women did seems to be as noteworthy as the movie depicts. NASA’s official pages dedicated to the women can be found here, here, and here. What does seem to be markedly different, at least in Katherine Johnson’s recorded experience, was the level of discrimination she experienced in the movie. Or more accurately, the discrimination she didn’t experience. Although the film depicts a fairly hostile work environment for Katherine Johnson upon her promotion from computer to the upper levels of flight planning, she reported that she was always treated a s a respected colleague, something I find believable. Her testimony rings more true than the movie depiction not because I underestimate the amount of racial discrimination present in Virginia in the early 1960’s. On the contrary, it rings true because of the high level of discrimination present in Virginia in the early 1960’s. There was a fierce competition between the U.S. and Russia at the time this story took place, particularly after the launch of Sputnik. Anyone who could help Americans close the gap might have been viewed as an asset. Further, there was no such thing as affirmative action during this time so Katherine Johnson’s mere presence was evidence of her worthiness to be there. If she could help accurately and quickly compute the math to get launches accomplished, she was no doubt welcomed. One of the noteworthy points of the existence of the colored “computers”, the name of the groups of women employed by NASA during that time to do mathematical computations, was the fact that they were all female. From the white perspective, this was not necessarily anything of note, as those girls could still marry “up”, if you will. However, from the black perspective it highlighted (for me at least) the reality that black women -long before the militant feminism of the mid to late 60’s- were already on the road to the education and occupational advantage over black men that is so often written about today as if it the gap only just began to widen in the 1990’s. This hidden disparity was one of the peripheral issues that made this film interesting to me even though it was never addressed by the film. Discussions of racism and sexism throughout film. A couple “damns” here or there, a depiction of Dorothy Vaughn sneaking a programming book from the white section of the library after not being allowed to check out books there. Lesson there for your kids. 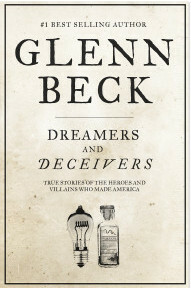 Dreamers and Deceivers by Glenn Beck, originally published 2014. I stopped listening to Glenn Beck’s radio program years ago when he started transposing a view of America as the promised land which will save Western Civilization onto everything he broadcasted. I’m glad I put that aside and read his book. I wasn’t sure I would like it, but it’s one of my favorite genres and the reviews for it were decent (when the reviewer wasn’t a foaming at the mouth liberal), so I figured it was worth a look. Interestingly, Goodreads categorizes this book as nonfiction, even though in reality it is a work of historical fiction. Well done, if my research is any indication, but fictional nonetheless. If you haven’t figured it out yet I enjoy historical fiction, partly because it makes history comes alive, and partly because I find myself more inclined to do research on the people and subjects presented, thereby furthering my own historical education. Like most people, my original understanding of history is woefully deficient. Beck peels back the layers and lays open the stories of names well known to most known Americans. Even Walt Disney, whose story we all know, is made fresh and new. The best stories however, are the ones we hear the least about. In my opinion, he could’ve spared us the background on Disney and Steve Jobs, although he did a very good job exploring the parts of their stories most of never heard of. Where his book shined however, is in his revealing of Charles Ponzi, Alan Touring, Grover Cleveland, and Alger Hiss. These are where his best storytelling takes place. Ponzi’s story was most engaging to me. Not because he was a likable man, but because of the human gullibility (not to mention greed) he was able to exploit from the earliest stages of his life. Like a cat, he seemed to have multiple lives. The list of source books and texts at the end of Beck’s book is exhaustive, too exhaustive for me to go through them all, but I hope to read at least a couple of them in the coming year. Of particular interest to me is the true father of modern radio, Edwin Armstrong, because up until I read Beck’s book I thought the founders of RCA were the true minds behind the technology. Content advisory: Nothing of note. 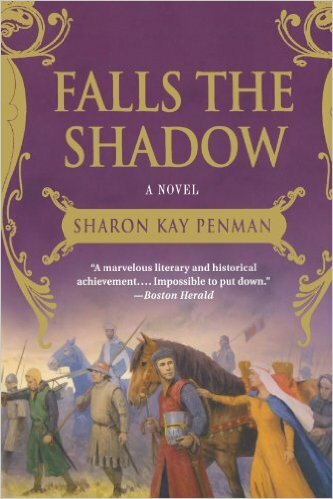 Falls the Shadow, by Sharon Kay Penman. Originally published in 1988, this is the second installment of Penman’s Welsh Prince trilogy, and largely explores the story of Simon de Montfort, a French nobleman who led a revolt against King Henry III of England. If you’re like me, you may wonder why this book in which Welsh princes are minor characters are a part of the Welsh prince trilogy. Never to worry, however. Although the Welsh princes’ ongoing saga with the English crown are periphery in this installment, their presence is relevant and the daughter of Simon de Montfort plays a major role in the final years of Welsh/English conflict and the conclusive end of Wales as an independent nation. This is, without hesitation or contemplation, my favorite of the three books because Simon de Montfort is my favorite of the heroes featured in the trilogy. Born with noble title but little means and more than enough confidence, he worked his way up through political savvy and determination into a place of prominence. As this novel is historical fiction, a quick bit of research supports Penman in her presentation of the 6th Earl of Leicester. She treats us to a captivating hero and the story is engrossing. Her interpretation of De Montfort’s clandestine and fruitful marriage to Eleanor, daughter of England’s King John, is sweet and poignant but without being overly romantic and sappy. Eleanor, unlike Joanna of Here Be Dragons, has no conflicting emotions or split loyalties. She is on Simon’s side, in every aspect, every step of the way. This made for a better story, at least from my point of view. I don’t like female characters (or real life women for that matter) who haven’t grasped the conclusion of the matter on loyalty to their husband. Eleanor is my favorite heroine of the three trilogies as well. Whereas Here Be Dragons was anchored by a great love story, Falls the Shadow moves along on the strength of political intrigue and war. Simon is a great warrior, another endearing trait, and whatever one thinks about his allegiance with the regional barons to revolt against the king in favor of reform, Penman gives us the picture of a man at peace with his God, his conscience and the merits of his crusade. There is lots of war and death and gruesomeness in Falls the Shadow, right up until Simon meets his violent end, complete with dismemberment by the royalists against whom he fought. There are a few sections which include sexual intimacy between Simon and Eleanor, but nowhere near as much as was contained in Here Be Dragons. Graphic content in this second installment is centered on the frequent clashing on the field of battle, and there is plenty of that. It’s still taking a while for me to get through my current read (Christendom Destroyed). 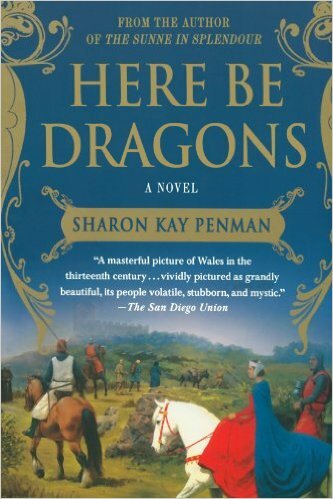 Since I’ve been pondering the right time to review and discuss Sharon Kay Penman’s Welsh Prince trilogy series, I figured I’d use my writing time this week to begin that. We’ll start with the first book in the series, Here Be Dragons. Historical fiction, done well, is great reading ad I enjoy it no matter what era it covers. Having only a rudimentary and peripheral knowledge of the 13th Century conflicts between the English and Welsh, this book also gave me the opportunity to do some educational digging. It is a practice of mine to check the authenticity of any historical fiction I read, and Penman does an admirable job of keeping with the spirit of life in 13th century England and Wales. Alas, it is historical fiction, so a plot summary is in order. Wales was a country where royal title did not automatically pass from the ruling prince to his eldest legitimate son. Illegitimate sons were given equal rights to claim inheritance as their legitimate brothers and as such, it was a kingdom in constant turmoil and conflict. Wales is a small country of proud people and a culture often at odds with those of England, to whom their princes must often swear allegiance in order to keep peace in their country. In 1283 England finally seized full control of all Welsh territory and went to great lengths to wipe out what was left of the culture of the people there, whom they considered barbaric and primitive, and making it fully English. The title Prince of Wales was not always held by an Englishman. However there was a brief period in Welsh history when the country was unified under the leadership of one powerful and charismatic prince, Llewellyn the Great, and it is this era which Penman uses as a starting point for her novel, Here Be Dragons. Llewellyn earned his place as ruler of Wales in battle and by brokering a peace with his brothers. He then marries Joanna, the illegitimate daughter of England’s King John to form an alliance, however fragile, with the English crown. After a rocky start to the union, Penman weaves together a great love affair, which becomes inevitably stressed when tensions rise between Llewellyn and the English king, who insists on treating the Welsh Prince as his vassal. While the story of Joanna and Llewellyn is central to the story, what drew me into this book was the family dramas, political intrigue, fierce battles, and descriptions of daily life in 13th century England and Wales. I was frequently engrossed with the well offered descriptions of natural beauty, perhaps because I live in the midst of suburban sprawl. The stark differences in the ways of government, family, and marriage rights in the two countries was fascinating as well, as I bothered to fact check Penman’s work. This isn’t to say that I agreed with Welsh law, but was fascinated that such laws existed. I like this book because it was fast paced without being a facile, and it was historically authentic. It has romance in it, and some racy stuff at that. However, I would not categorize it as a romance novel as it can just as easily be categorized as an adventure story, or a war story.